BUY FROM ***VICTONY*** ONLY. ANY OTHER OFFERS ON THIS LISTING ARE UNAUTHORIZED SELLERS AND NOT SELLING THE PRODUCT ADVERTISED. MAKE SURE THE SELLER IS "VICTONY"
Since the product is a precision electronic accessorie, if the item be damaged during shipping (in most cases this will not happen), please feel free to contact us. We will do our best to solve it for you. ★Using 4pin IDE to get external power,more powerful,and reduce the burden of the motherboard. ★1x adapter PCI-E card can be inserted in any PCI-E Slot: 1x, 4x, 8x, or 16x! ※【Compatibility】The version of this item is VER 006C riser kits and PCI-E Adapter Board (4 in 1) are the perfect solution for setting up Ethereum mining rigs (or any other GPU-mined altcoin), whether small open air rigs or large rack based miners. This item is Compatible with DOS LINUX WINXP WIN7 WIN8 WIN10 ect. ※【High Precision Capacitors】Pcie riser adopts the most advanced capacitors on the market which features in higher precision and higher perfomance, making graphics power supply much more stable and secure, double protects your GPU, and secures your investment. ※【NEWLY UPGRADED】3 High Quality Solid Capacitors for reliable and safe power delivery. Gold plated contacts for flawless connctivity and a long lifespan. ※【What you will get】 9 month warranty.6x PCI-E 16X riser board. 6x Adapter board. 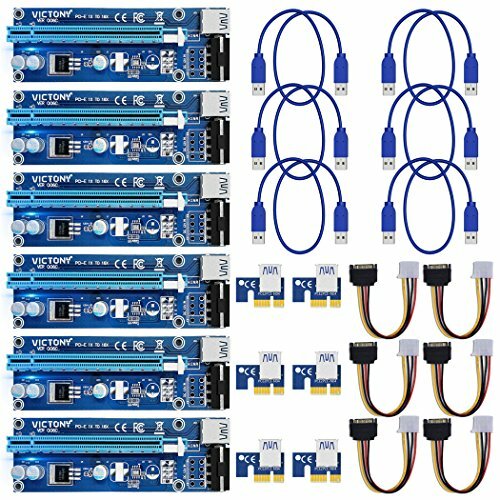 6x PCI-E 1X adapter card ,6x 50cm USB 3.0 riser cable, 6x 6-pin Molex to 15-pin SATA power cable.